This past Saturday my nephew Bernard and I did a little day hiking on the Appalachian Trail in the Delaware Water Gap. During our expedition we chewed on teaberry leaves and foraged a few wild raspberries and blueberries – leaving plenty behind for fellow hikers to discover. The forecast called for thunderstorms but the weather was on our side, gently raining shortly after each time we set up the hammocks for trail-side siestas. We stopped at Rudy’s Tavern in East Stroudsburg for a few pints and delicious bar pizzas for some post adventure refueling. Sunday was filled with catching up with many odds and ends around the house. I worked a little on my Magic Mirror carving which I hope to complete soon. I also did some taxidermy experimenting with a song sparrow my sister provided me with a few months ago. To my surprise I find the task of taxidermy relaxing. Freezer storage, however, is at a minimum at home and I have many big woodworking projects (some started years ago, some to start soon) on my horizon so I’ll likely pause the taxidermy hobby for a while. This past weekend Amy and I visited with Pennsylvanian friends Linda and Jeff. We enjoyed good home cooking and plenty of fresh air. After finishing a delicious chili dinner on Saturday we lounged in the pasture around a fire, chatted and waited for the stars to come out. Jeff helpfully shared his knowledge of the sky while we peered through binoculars and experimented with cameras. We admired the moon (that’s the moon in the photo, not the sun) which rose later in the evening and one by one we doze off to sleep in the delightful cooling air. Sunday morning Jeff prepared delicious french toast with eggs freshly retrieved from the hen house, accompanied by treats Linda cooked up. Energized by a relaxing night of sleep and a hearty breakfast we sprung into action. With Linda’s instruction we got creative making tie dye shirts. As the dye was setting Linda took the time to teach Amy the art of canning while Jeff and I entertained ourselves doing man stuff (not that canning isn’t man stuff). The experience flew by and we hope we can find the time to do it again soon. Also, I was mentioned in a news paper article this week regarding the Essex County, NJ Parks System. Check it out here. While visiting friends in Romania we had the awesome opportunity to visit Cimitirul Vesel, better known as the Merry Cemetery in Sapanta, Maramures. This has been on my list of places to visit for quite some time. The cemetery is filled with hundreds of colorful woodcarved grave markers. Each tombstone includes a carved scene which represents the deceased with a carved narrative about the person beneath. Exploring this wonderful place is fascinating! I was thankful our hosts were patient with me as I examined the craftsmanship and creativity surrounding me. The slideshow above is a fraction of the images I captured during my stay. I departed the Merry Cemetery inspired with many new and creative ideas. I hope to find the time to tackle a few of the many ideas which resulted from the tour. I’ve returned freshly from an awesome Romanian vacation. My wife Amy and I visited with our Romanian friends Delia and Marian. I became friends with Marian while discussing 3D animation online. Amy and I visited Marian, and Romania, the first time thirteen years ago. Joining us on this two week trip were our German friends, fellow woodcarver, Lydia and her husband Hans. I hope to share more of the Romanian experience in future blog posts but for now I will share some audio I recorded at various locations. Mila 23 is a small village located in Tulcea County, Romania, nestled in the middle of the Danube Delta Reserve. Thanks to Marian’s diligent planning I toured the Danube Delta for two days via speed boat and 4×4. We soaked in plenty of nature accompanied by sights of wild horses, pelicans and egrets. While relaxing at our villa in Mila 23 I placed my audio recorder on the windowsill to capture nature’s songs. Mila 23 Day: Various birds, nature, distant boats and sounds about the villa. Mila 23 Night: Dogs, insects, distant boats and sounds about the villa. Sighetu Marmatiei is a quite village in northern Romania near the Tisa River. Sighetu Marmatiei Morning: Various birds, roosters, nature. Sighetu Marmatiei Day: People, playing children, vehicles, dogs. Mamaia is the beach resort district of Constanta Romania. Mamaia: Passing vehicles, pedestrians, distant discos. My wife and I had the pleasure of getting the camper trailer out for a weeklong end of summer vacation. Our destination was Crystal Grove Campground and Diamond mine in St. Johnsville, NY. We shared two exciting and fun days smashing stones to discover Herkimer diamonds. Finding the beautiful crystals was easy with a little experience and practice. Evan and Cecily are hospitable hosts and go above and beyond to ensure everyone is enjoying themselves. I had an opportunity to fly my Hubsan X4 drone around the area. Having so much open space and sky to soar around is liberating! I collected some of the video footage I recorded from the drone and assembled a [somewhat shaky] video. Our poodle Fleur is oblivious about the thing buzzing around her head. I added a rocking Nightwish tune to add drama to the flight. One night we found ourselves with too little time to prepare dinner at the camp. We drove into St Johnsville and stopped in Cosmo’s Bar & Grill for some takeout burgers and wings. I felt at home chatting with the bartender Mike and Speedy the local patron. Chris the chef invited Fleur to hang out back with his dog Bronx. The food was off the charts delicious. All in all it was an enjoyable visit. We hope to return to the area for more fun in the near future. Some of you may recall my wife and I hiked the Kalalau Trail on the Na Pali Coast of Kauai, Hawaii the last week of May 2015. When I was planning the trip I searched high and low for a good map of the Kalalau Trail with no success. The first complete map I found of the trail was in the parking lot at the trail head. I took a photo of the map and used the map on my camera screen while we were on the trail. I brought the photo of the map home and digitally cleaned up the artwork in Photoshop. I added a few tips and hints regarding what I learned about parking safely and good places to camp along the way. I’ve done my very best to match the map at the trail head. To my recollection this map reflects what I experienced during my backpacking adventure on the Kalalau Trail. I am sharing this map to help plan your adventure. The above image is only a small section of the complete map. Please remember, I am not a cartographer and I cannot guarantee the accuracy of the information. Amy and I have recently returned from two weeks on the Hawaiian Islands: Oahu, Big Island, Maui and Kauai. Although we kept a fast paced schedule, we found time to relax and enjoy the sights, sounds and sensations Hawaii offers. On the Big Island we had the pleasure listening to Kai Hoopii play ukulele while singing Hawaiian falsetto during a performance at Volcano National Park. I recorded the show and in time I plan to prepare the recording for download. I did find time for a few creative endeavors. I painted a few watercolors and I worked on a much larger ongoing project (more on that in future posts). While driving in Kauai we picked up a hitchhiker. To our surprise our passenger turned out to be Donny Pike of the classic vocal group The Lettermen. As if that brush with fame wasn’t enough we also learned of a secret surprise Neil Young concert that evening in Paia. Amy and I decided to stand in line and take our chances since our lodging was across the street. In short we waited four hours, didn’t get in the venue but made new friends. We did have a chance to watch through the windows and listen in the parking lot. Which was pretty cool anyway. I had a great time appreciating the local art and wooden tiki carvings. The luau at Kilohana Plantation was a lot of fun. The open bar and buffet provided a solid foundation to enjoy the (touristy) program of singing and dancing. The great people at Kauai Backcountry Adventures hooked us up with a fun day of tubing and zip lining. For me, the highlight of the trip was hiking the Kalalau Trail on the Na Pali coast. 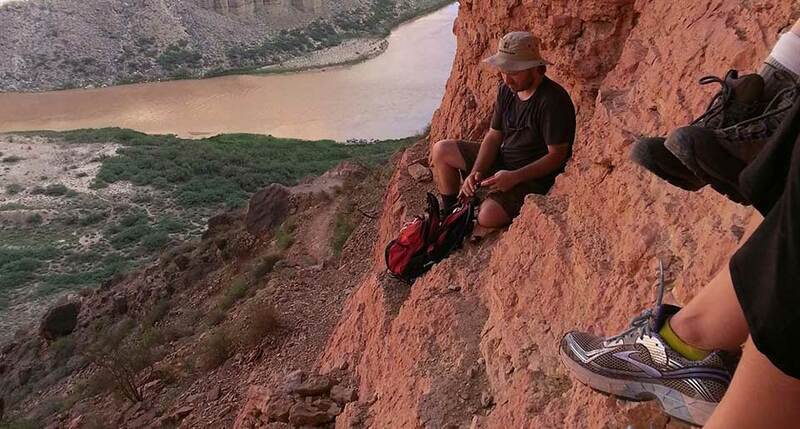 The dramatic scenery and strenuous trail is spectacular. All in all Hawaii was a great time. I’ve just returned from a two-week Grand Canyon O.A.R.S. Dory Boat vacation on the Colorado River. I had an outrageously awesome time making new friends, gawking at the stunning scenery and taking in everything Mother Nature has to offer. I stole a few solitude moments to plein air watercolor sketch the enchanted surroundings. The canyon seems to nurture creativity providing intoxicating landscapes full of inspiration. Being in the canyon on the Colorado was a thrilling experience. New friendships were formed as well as great memories. Words and photographs cannot describe the Grand Canyon; the canyon must be experienced from within to be truly appreciated. I am thankful for the privilege of two weeks in the good hands of O.A.R.S. on the water and in the sand, sleeping under the Milky Way. 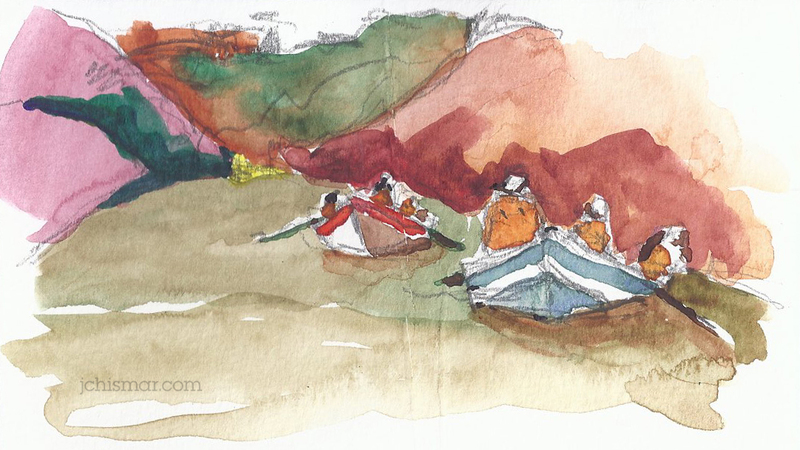 Please check out more of my Colorado River watercolor sketches in my art gallery.